Baltimore Mayor Stephanie Rawlings-Blake has fired Baltimore Police Commissioner Anthony W. Batts after a recent rise in the city's homicide rate. Baltimore officials had largely ignored an ongoing call for Batts' resignation after the April death of Freddie Gray in police custody and the subsequent demonstrations to protest police violence against African Americans. According to CBS News, since Gray's death, there has been "a sharp increase in violence, with 155 homicides this year, a 48 percent increase over the same period last year." A news release viewed by CBS News announced Batts' firing and also noted that Deputy Police Commissioner Kevin Davis will become interim commissioner. 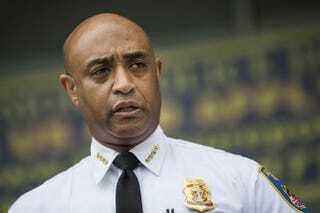 WBAL notes that Davis is a veteran police official with ties to the Maryland area. He was a high-ranking official in the Prince George's County Police Department before he left to join the Anne Arundel County Police Department as its police chief, a position he held until he resigned in November 2014. He then joined the Baltimore police force in January 2015.